I blame Castel di Sangro. Joe McGinniss’ 1999 classic set the bar too high for tales of sporting underdogs. Those expectations just aren’t realistic and the clue is in the title; ‘The Miracle of Castel di Sangro’ refers not just to the on-field triumphs but also to the once in a lifetime off-field access. Will we ever see the like again? Judging by Euan McTear’s Eibar The Brave, the answer is probably not. What is sadly missing from this excellent book about Spanish football’s greatest overachievers is the voice of the actors themselves. What was it like to go from playing in Segunda B to Primera division in just two seasons? I don’t really know. We hear from La Liga experts Sid Lowe, Guillem Balague and Jason Pettigrove but with the exception of Derby County’s Raúl Albentosa, the players are largely silent. Eibar is described as ‘the most relaxed football club in Spanish football’s top flight’; the Ipurua Municipal Stadium is never locked, and yet the closest we really get to the action is the crazy fans. Rant over because despite this, against the odds, Eibar The Brave succeeds in bringing this incredible story to life. Like Eibar manager Gaizka Garitano, McTear does a fantastic job with somewhat limited resources. His match reports/diary entries are full of character, humour and affection, even when the scoreline doesn’t deserve it. The will-they-won’t-they story of their 2014-15 La Liga debut is neatly woven throughout, with space in between to delve back into the history books. Eibar The Brave is brilliantly researched, taking in the post-civil war founding of the Basque club, its promotions and relegations, its heroes (Xabi Alonso and David Silva amongst them), its stadium, its enterprising president and, most importantly, its fans. The Eskozia La Brava group in particular gets the airtime it deserves for providing such amazing ánimo in a stadium of 6,000 people, in a city of just 27,000. In less than 200 pages, McTear even finds time to explore the wider issues at play in Spanish football, touching on financial regulations (with Eibar and Elche at opposite ends of the debt scale), TV rights, cup competitions, fan violence, regional politics and la cláusula del miedo. 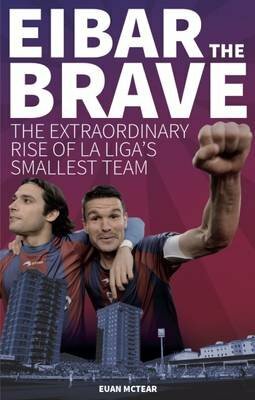 As such, Eibar The Brave is an informative guide to a league that you may watch but not necessarily always understand. The ins and outs of relegation head-to-heads, for example, take a bit of explaining to those schooled in goal difference. This overall picture that McTear paints so engagingly serves to reiterate the special, if not unique, nature of Sociedad Deportiva Eibar. A debt-free, ‘family’ club that acknowledges its ‘natural home’ is in the third division, and yet finds itself playing against goliaths like Ronaldo and Messi on a weekly basis; a team that respects and involves its fanbase and gets undying love in return from all over the world. The unbelievable tale of Eibar certainly isn’t over, and hopefully McTear will be on hand to narrate the next instalment, perhaps with some new friends to keep him company.